You may want to check out Sarimanok: Maranao Legend and Islamic Mythology. 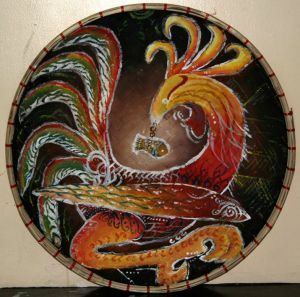 The legend of the Sarimanok lives on among the Muslim inhabitants of Mindanao in Southern Philippines. To them, this mysterious bird is a messenger, swooping down from the heavens to catch fish which it delivers to the Sultans as words from Allah. There are many versions of the story. One tells of a beautiful and kind daughter of the Sultan of Lanao who was taken by a majestic bird. According to this version, Sari, a well-loved princess of the Maranaos, won the heart of a deity-prince who transforms into a giant rooster with glittering feathers of varying shades. Unlike the ordinary fowl, however, the creature rules the sky like an eagle and has magical powers. The prince, in the form of a bird, appeared before Sari and all the people of Lanao on her 18th birthday. Speaking to them in their native tongue he said, “I have come to take the maiden whom I love.” As if in a trance, Sari approached the creature and they disappeared into the skies. The Sultan missed his daughter so much that he commissioned the best artists of the kingdom to make a replica of the bird. He ordered the people to look at the monument with reverence so that they will never forget Sari. In honor of his daughter and the magnificent creature (which in their local tongue is called amanok), he called the woodcarving, Sarimanok. Sari lives on among the Moros, and with her the cultural and artistic symbol that is the Sarimanok. Yet there is an unusually low appreciation of this national heritage. In fact, even the recognition as National Artist of a sculptor who devoted his art to the Sarimanok took years to happen because of a gulf in perception of what is considered art between the people of the urbanized Christian centers and the Islamic outskirts of Mindanao. In 2006, the National Commission for Culture and the Arts (NCCA) awarded Dr. Abdulmari Asia Imao the National Artist Award for sculpture, the first Muslim to be given the country’s highest recognition for artistic and cultural achievement and contribution since its creation in 1972. This happened only after the intervention of Pres. Gloria Macapagal Arroyo which, according to political analysts, was a strategy to gain favor from the Muslims who comprise majority of Southern Philippines. In fact, without the president’s hand, Imao had no chance of the award after he failed to make it in the first shortlist prepared by the NCCA. As to his skills in sculpture, no doubt Imao is a master. But he is also highly trained in painting—being an apprentice of National Artist Napoleon Abueva— and in metal casting and photography. He graduated Bachelor of Fine Arts in Sculpture in 1959 at the University of the Philippines, and three years after, he earned his Master of Fine Arts in Sculpture at the University of Kansas. Compared to other sculptors, however, Imao’s fusion of Islamic art, design and culture in his oeuvre make him standout as an artist who employs techniques of the West to make unmistakable Eastern Islamic works. But the 73-year-old artist admits that his decision to focus on his native culture came only after he has travelled the United States, Columbia and Europe, seeing with his own eyes the works of Picasso, Van Gogh, Matisse and Dali, among others. Returning to the country in 1963, he determined to master Moro culture and arts, observing and learning from the Maranaos and T’bolis; at the same time, teaching them about modern bronze casting techniques. 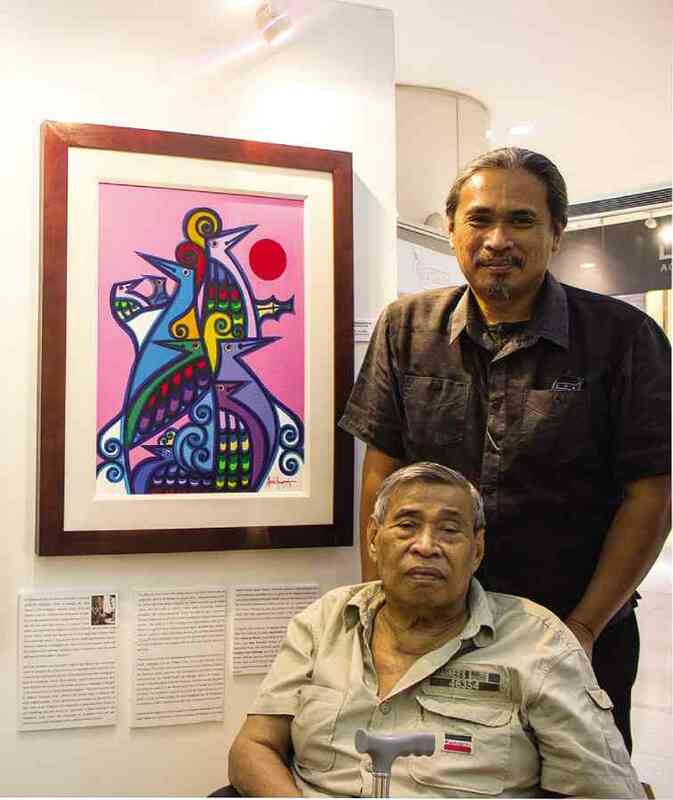 Imao describes his art as bearing three distinct motifs—the Sarimanok, the fish, and the okir, or aesthetic curvilinear designs. As an artform, the okir, ukit in Filipino—meaning “to carve” or “make designs upon”—can be feminine or masculine in execution usually on wood which is abundant in Mindanao or in brass. The overall sculpture takes the form of either the Sarimanok or the fish, or a combination of both and is adorned with elaborate okir patterns and designs. Some of Imao’s works bearing this style are displayed in the Vargas Museum in UP Diliman and at the National Museum. The artist is also a researcher and a professor, documenting photos of the Sulu people, tribes and art for local universities like UP and the Ateneo de Manila, as well as for international fellowships. With such contributions to Muslim art through sculpture and paintings, and the Moro people through his researches, why did Imao fail to make it in the NCCA shortlist in the first place? UP Prof. Felipe de Leon was among the panel of judges at the NCCA on the year Imao was recognized a National Artist, and he offers this simple answer: Majority of those who adjudicate in the National Artist Awards belongs to subcultures with Western orientation that do not appreciate the Moro or Muslim art. “The lumad, Moro and folk subcultures are the most Asian. They are the least Westernized. Unfortunately, those who run the National artist awards belong to the pop and academic cultures which are the most Westernized!” De Leon said. “The indigenous craftsman is not known as an individual artist. He is the community’s artist. That’s how communal Filipino art is. But the more you belong to this culture, the less likely you’ll be hailed a National Artist,” he lamented. De Leon even revealed that the judges’ Western taste goes beyond art and is sometimes directed towards the artists themselves. He says that they are Western in the sense that if the artist is not articulate or fluent in English or if he is not formally educated in an art school, or if he uses unorthodox media, they consider them pseudo-artists and their works inferior. For Dr. Abraham Sakili, among the authors of Imao’s nomination papers for the National Artist Awards, culture plays a big role in the delay. “You cannot isolate the judges’ cultural belongingness in their choices…Culture is the primary influence in their decisions,” he said. Sakili added that because of cultural imprints on people, objectivity is a myth in the entire selection process. And he also believes that one reason has something to do with Imao’s affinity. “We cannot deny it. There is a negative stereotype against Muslims in the Philippines,” he said. Because of these attitudes some members of the NCCA have lost hope on the National Artist Award and instead turned to the “Manlilikha ng Bayan Award” which specifically recognizes the contributions of indigenous artists. If he were to judge, De Leon said Imao is deserving of the National Artist Award, but he said there are also several other Muslim artists who match or even surpass his craft and contributions that will never be called National Artists because they embody an art concept that is foreign to most NCCA judges. For Dr. Sakili, the variety and the level of expertise in Imao’s works make him very deserving of the award. 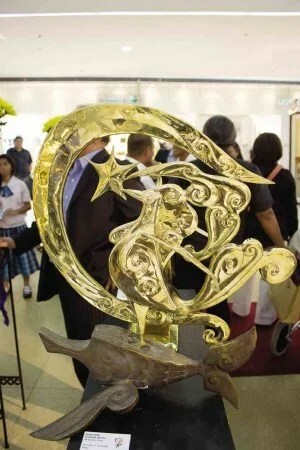 In addition, peer reviews of his sculptures, a criterion in the National Artist Awards, are overwhelmingly positive, not to mention his several awards like the “Gawad CCP (Cultural Center of the Philippines) sa Sining”, and the Presidential Medal of Merit for his contribution to culture and arts. But as to his roots, native worldviews and experiences, Imao is not one of them. He belongs to a league of artists who integrate art in daily life. Coming from a remote island in Pata, Jolo, Imao has known sculpture since childhood being born into a family of balangay or boat-makers, woodcarvers and entertainers. In an island where no other form of leisure or entertainment existed, Imao learned to appreciate the sights, sounds, smell and the texture of nature. His first attempt at serious sculpture was inspired by the vast ocean around their community. He carved trophies for local swimming competitions. From his hometown, fate brought Imao to UP with the help of several people. Tomas Bernardo was once in charge of a Philippine Navy exhibit in Jolo. He noticed how fascinated Imao was with the paintings on display. Because of that, he offered to help him continue his schooling in Manila. Upon reaching the metropolis, he sought scholarship from UP but was rejected. His spirit did not waver; instead, he sought the audience of then Pres. Ramon Magsaysay who was giving out scholarships to deserving students. Though he never got to talk to President Magsaysay, a palace official, Jose Ansaldo, noticed him in Malacanang. Ansaldo was moved by the young boy’s persistence after seeing him coming back to the palace everyday in the hope of securing a scholarship. In exchange of washing his five cars daily, the official financed Imao’s schooling in UP. From then on, the National-Artist-to-be garnered several scholarships and grants, giving him the opportunity to learn art all over the world. It took three nominations and the intervention of President Arroyo before Imao finally joined the ranks of the likes of Bienvenido Lumbera, Napoleon Abueva, Carlos “Botong” Francisco, among others. “Imao’s works are enough to make him National Artist. So why do we still need Malacanang to intervene?…I have seen the credentials of the other awardees and Imao can match or even surpass them. So I raise the question, ‘Why just now?’,” Dr. Sakili said. Imao is a glaring proof of how the monopoly of a dominant worldview and ideology can defeat the development of Filipino culture and the pursuit of national identity which can be described as very diverse. For an award that supposedly aims to recognize “preeminent achievements that have enhanced the Filipino’s cultural heritage,” it is puzzling how the truly Filipino art in the lumad, folk and Moro subcultures fail to make it to the top. Instead, the Western notion of fine arts continues to become the standard. For the sultan who waits for his daughter’s return, hope is embodied in the Sarimanok woodcarving. For a nation that struggles to put together its history, culture, and identity, Imao is a piece of the puzzle representing the Philippine Islamic roots. His recognition, though veiled by politics, is one step closer in bridging the gap of art perception between the people of the urbanized Christian centers and the Moros of Islamic Mindanao. At the same time, his story is a warning that unless Filipino art boldly treads its indigenous past and lineage, it will never find the identity it seeks.